Does your profession involve the use of complex search strategies? Do you know of anyone from those sectors who could lend us a little of their time to discuss (and ideally demonstrate) the practical challenges that such professionals face in formulating complex search strategies? If so please get in touch with us at tgr AT uxlabs.co.uk. In return we’d be happy to share a pre-publication copy of any report we produce. Regular readers of this blog will know that I’ve had the privilege of presenting various training courses around Europe over the last year or two, focusing primarily on the intersection between search and user experience. 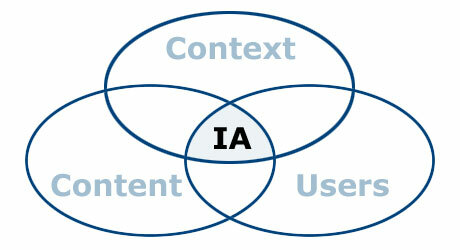 For 2014 I’m pleased to announce a new course offering: an Introduction to Information Architecture. This will be presented for the first time at the University of West London on February 26, and is a collaborative effort with Stephann Makri of City University. Our aim is to offer the best of both worlds: academic rigour backed up by the experience of working a wide variety of commercial projects, in a format that emphasises the use of group work and practical exercises. Just a quick heads up that the London Text Analytics group is meeting on Weds Feb 12 to hear about AnnoMarket: a cloud-based text annotation marketplace. There’ll be complimentary drinks and nibbles, courtesy of our sponsors (the AnnoMarket project). We’ll be meeting at the Plough on Museum Street from 18:30. Further details are appended below, but if you’d like to join us just sign up on the event webpage. See you there! As the dominant interaction paradigm used throughout the world of eCommerce, faceted search provides a framework that supports the exploration and selection among thousands – if not millions – of diverse items. But sometimes faceted search needs to be combined with other types of UI control to provide alternative ways to view and organise content. In these cases, the interplay between the various components can be deceptively complex, and small details can make a significant difference to the overall user experience. In this post, we consider some of the issues and examine a number of design solutions. Faceted search enables users to intuitively explore complex information spaces by progressively refining their choices in each dimension. When combined with keyword search, this approach becomes incredibly powerful: so much so that faceted search is now the dominant interaction paradigm for most eCommerce sites and is being applied to an increasingly diverse range of search and discovery applications. However, with this power comes a challenge: given the ease with which information spaces can be explored, what techniques should be employed to communicate the user’s current location and navigation options within that space? And how should these mechanisms be extended to facilitate further exploration of that space? This post looks at some of the main techniques and reviews their strengths and weaknesses. One of the simplest techniques by which navigational state is communicated is through the use of breadcrumbs. Breadcrumbs have a long history in the development of the web (and hypertext systems in general), and have been the subject of many previous research studies. In their simplest form they are rendered as a trail which indicates the user’s current position in an information hierarchy (or taxonomy), e.g. But the whole point of faceted search is to allow navigation along several independent dimensions, rather than just one. So in this case, we need a mechanism that will scale to accommodate multiple dimensions. 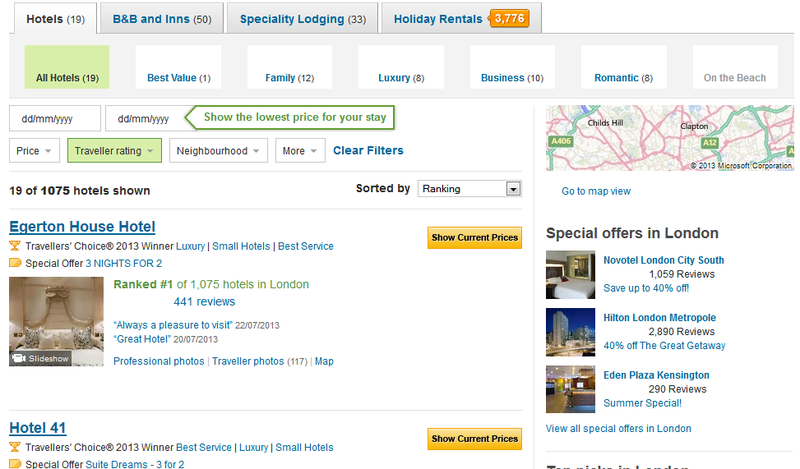 Looking closely at the faceted navigation menus, we can see that each one contains the current selection (e.g. Format=paperback, language=English etc.) and the means by which the user may remove the current selection for any given facet (e.g. Any Format, Any Language, etc.). Note the subtle use of bolding to indicate the currently selected facet value, the use of indentation to indicate hierarchy, and the use of chevrons to imply going “back” to a previous state. However, there are two shortcomings with this design. First, it doesn’t scale well to results that possess a large number of facets whose combined vertical height extends beyond the current screen height. In such cases, a proportion of the facet menus (and their currently selected values) will be hidden below the fold or otherwise out of view, and therefore not concurrently visible (without vertical scrolling). 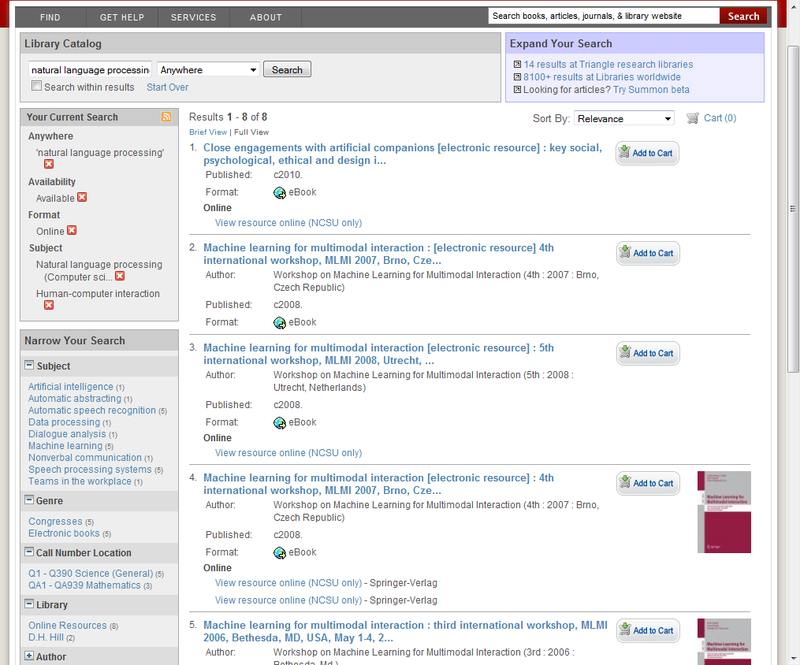 To a degree, this is mitigated by the presence of the conventional breadcrumb trail displayed immediately above the search results, but the visibility of this is questionable, and the lack of inherent structure makes its informational content relatively difficult to parse or comprehend. Secondly, and more importantly, is how this approach would scale to accommodate multi-select facets. In other words, how would conjunctive (AND) or disjunctive (OR) facet values be rendered and selected? Despite the evident elegance of the current design, it is hard to see an immediate solution to this issue that would not involve some degree of deviation from the simple inline approach. Note how this overlay allows only one facet to be visible at any one time (in keeping with the principles we discussed in the previous post on Interaction Models for Faceted Search). Like Amazon, eBay also includes a conventional breadcrumb trail above the result, with what appears to be an even less structured treatment (bare facet values delimited by commas). Interestingly, eBay allows the user to close individual facets (presumably to optimise vertical screen space) but only if they have no current value selected. So in the above example, the user can only close the Fuel Type facet and the ones immediately below it. This principle, one suspects, may be specifically to minimise the likelihood of inadvertently hiding selected refinements from view. 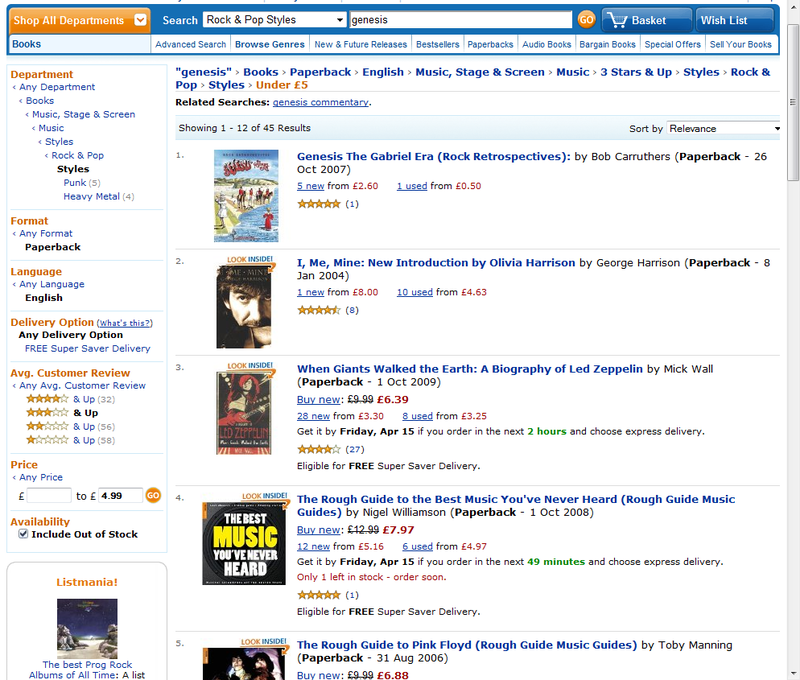 Despite these useful modifications, the design still suffers from the same fundamental shortcoming as Amazon: in cases where a given result set possesses a large number of facets, their combined height may extend beyond the current screen height, making the overall navigation state difficult (if not impossible) to comprehend without repeated vertical scrolling. For relatively simple B2C applications, such as the eCommerce examples above, perhaps this is a suitable compromise to make. In such cases, the principles of elegance and simplicity are likely to outweigh any requirement for scalability and visibility of navigational state. However, as mentioned earlier, the applications of faceted search are being extended to a growing range of information discovery challenges, including more complex applications in business intelligence and analytics. In such cases, the need for a more scalable approach that more effectively communicates navigational state becomes more significant. In the next section, we’ll look at some of the alternative solutions for addressing this. The advantage with this approach is that all of the currently selected refinements are shown grouped together in a single place, which remains visible in the same location no matter how many facets are present. The overall navigational context is therefore immediately visible without vertical scrolling. However, one consequence of this approach is that a different shortcoming now becomes apparent: what facets do these particular values apply to? For example, what facet led to the selection “recipe” or “main dish”? Since these values are no longer displayed in context, the user must either recall which facet was associated with each selected value or attempt to infer that from the labels themselves. In this case, we see that the Breadbox contains not just the facet values, but the facet names too, i.e. 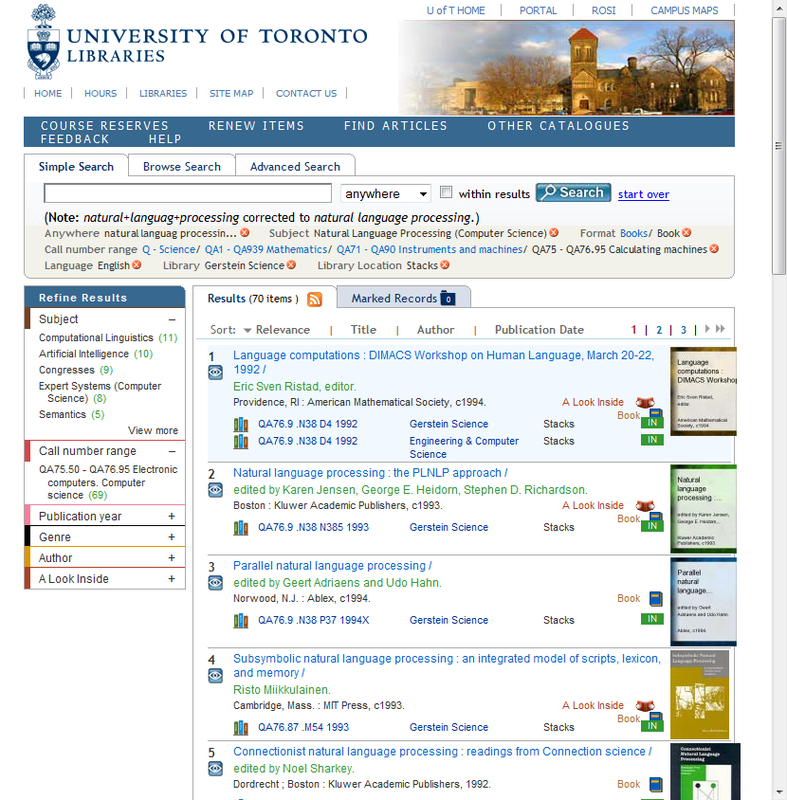 Format=’online’, Subject=’natural language processing’ etc. The word wrapping in this particular example is somewhat unfortunate in that the controls to remove each refinement have wrapped as orphans in two cases, but the principle is clear: each facet value is unambiguously associated with its parent facet. Note also that this design scales easily to support multi-select facets (one of the key shortcomings of the inline breadcrumb design): the multiple selections for the ‘Subject’ facet are clearly visible and comprehensible in the above design. In this example, we see seven separate refinements laid out in sequence, complete with facet labels and removal controls. However, the comparison with the vertical breadbox makes one shortcoming of this approach quite evident: the content of the breadbox is much harder to comprehend, as the structural relationship between the facet/value pairs is now much less apparent. Note, however, that in all the above examples we’ve assumed that the facets themselves are laid out using the vertical stack pattern. There are, of course, other configurations: notably open parametric, in which the facets are laid out in a consistent horizontal orientation, and displayed in their open state by default. In this configuration, the currently selected facet values are much more immediately visible, to the extent that a separate breadbox may not always be required. In our discussion above, we have outlined two contrasting approaches to wayfinding in faceted search: breadcrumbs (in particular the inline version) and breadboxes. There are of course other variants, notably Greg Nudelman’s Integrated Faceted Breadcrumb. At first blush, Greg’s design seems quite radical, with the breadcrumb transformed into a flexible container that provides direct support for key navigational functions, such as updating facet values in situ; selecting a “See All” option to remove a refinement; etc. Greg also uses the IFB to argue in support of some key navigational principles such as explicit labelling of the facets (as discussed above), retention of the navigational context wherever possible; and so on. But on closer analysis, it could be argued that many of these actions and principles are precisely those for which the inline breadcrumb approach has already been shown to work well, particularly the eBay incarnation with its support for complex navigational options such as multi-select AND and OR. 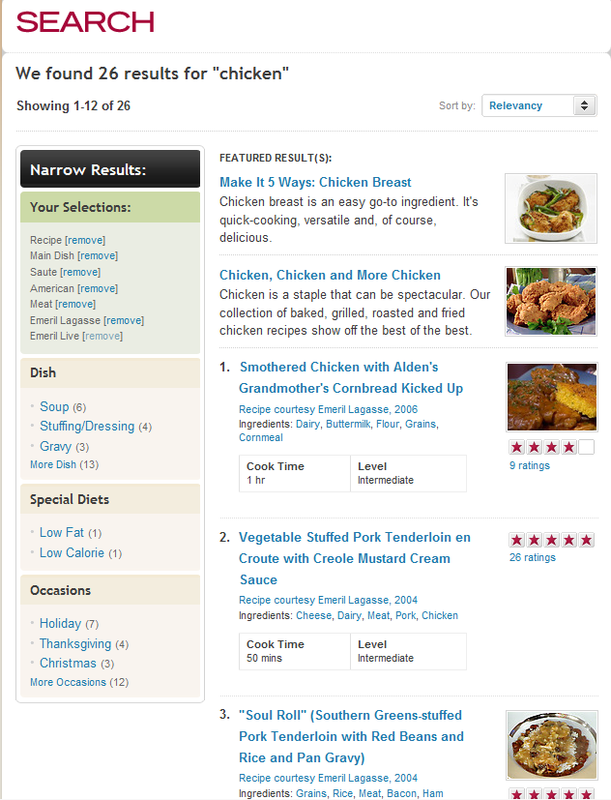 So it remains to be seen whether the integrated faceted breadcrumb is the first of a new set of wayfinding techniques in faceted search, or whether it is essentially an exploration in the re-allocation of navigational functionality from one component (in this case, the facets) to another (the breadcrumb). One of the great strengths of faceted search is the way it allows users to explore complex information spaces in a seamless and intuitive manner. But with that strength comes a challenge: what mechanisms should be employed to communicate the user’s current location and navigation options within that space? In this post we’ve examined some of the main techniques and reviewed their strengths and weaknesses. For most simple eCommerce applications, the elegance & simplicity of inline breadcrumbs may be more than adequate. But for more complex information discovery applications, a more scalable approach may be required which consistently displays the current navigational state in a dedicated container. In cases such as these, the breadbox may be the more scalable approach. In a future post, we’ll complement the ‘advanced’ material above with a look at some of the more basic issues in faceted search design, such as facet types, layout and other display considerations. Last week I had the privilege of attending James Kalbach‘s course on Faceted Search & Beyond, held as part of Syntagm‘s UXFest (“like Oktoberfest, but without the beer… and it’s in February”). Yes, I’ll admit it… I was curious. 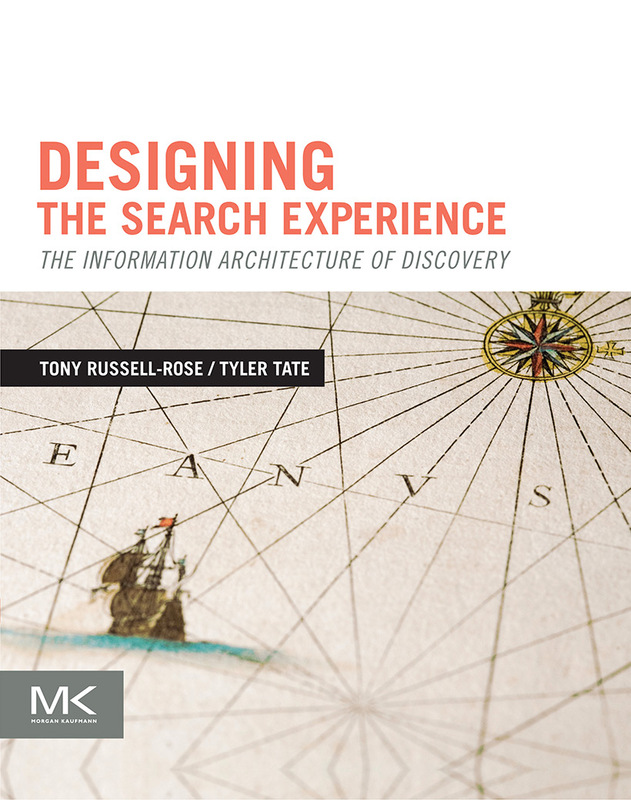 After all, I’d been running a broadly similar tutorial for the last two years or so, covering the whole gamut of Designing the Search Experience but packed into one (intensive) half day session. 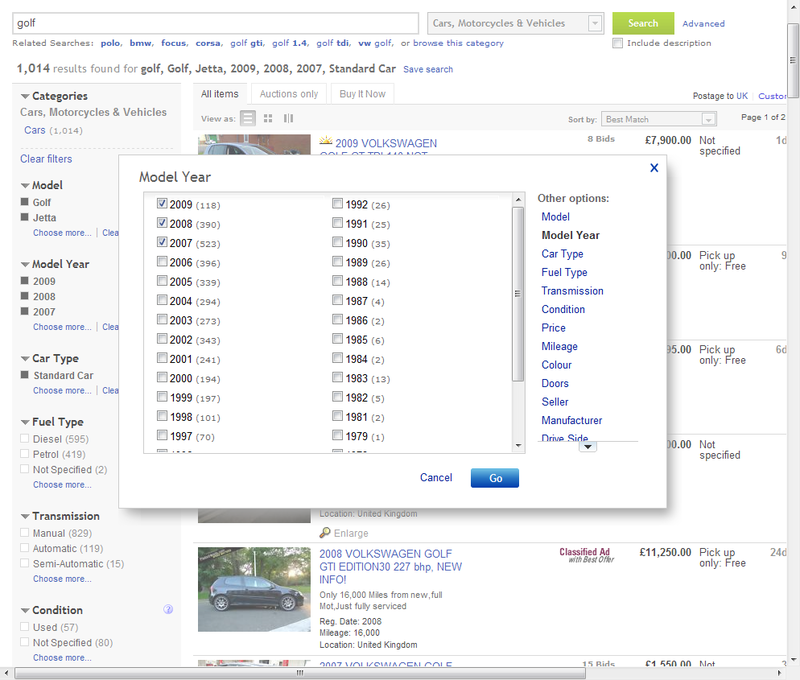 How could James manage to spin out just the faceted search element to a whole day? This I had to see. But I wasn’t disappointed. Like many complex design challenges, there is a fractal nature to them: beneath each major design decision (or principle) there is a myriad of smaller ones. And James very effectively surfaced the key ones in a lively, engaging, coherent style. Where should facets appear on the page? How should values be displayed? How do you see further values? How (and where) are selected facet values represented? Many of these are covered as separate posts his blog, but it was good to see them all drawn together in what became a very cohesive whole. He also made good use of the practical exercises. I know from experience that this can be very hard to get right, especially considering the wide range of backgrounds that courses such as this attract. If you make the exercises too focused on practical design skills some people will inevitably struggle (at least at first), but if you make them too abstract and conceptual and you lose the point of a face to face session and the co-learning experience it entails. He also presented the material within the context of an overarching design process, i.e. framing it within the context of the typical stages, roles and tools applied in a commercial setting. Some of these mirrored to our own engagement models and processes within Endeca, but the places where they differed also provided interesting points for discussion. The course also benefited from numerous illustrations and examples – somewhat inevitably, dare I say it, drawn from a set characterised by Endeca implementations. James also did a commendable job of relating his material to the relevant peer-reviewed scientific literature (something at which the UX practitioner community has not traditionally excelled). If I was to be uncharitable and point out one potential limitation it was that the course had a slightly “tactical” emphasis, focusing on the detail of individual on-page design decisions when some consideration of the broader strategic issues and overall experience might have provided a more rounded treatment. But I’m being really picky there, and besides, that would have made it a different tutorial. 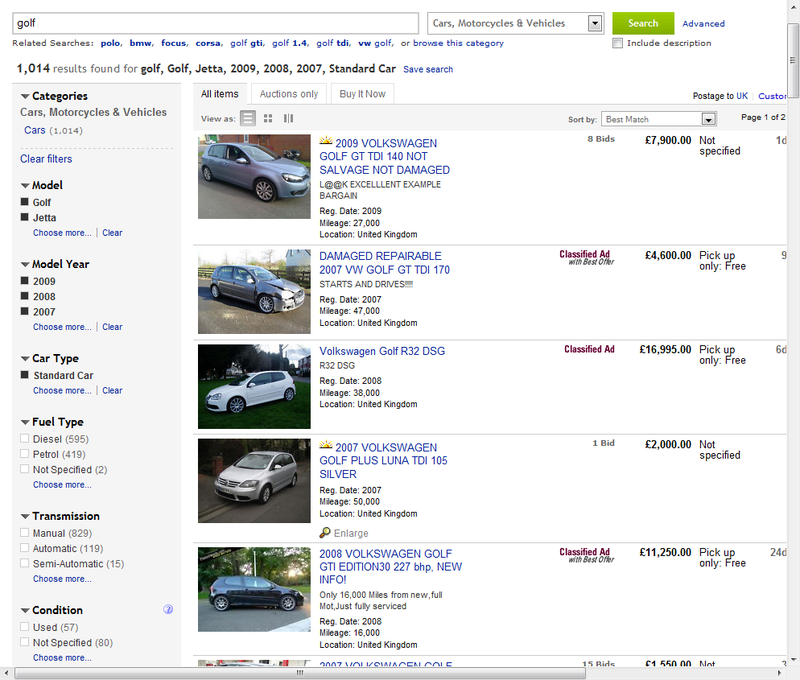 Is search behaviour becoming more sophisticated? One of the threads emerging from the recent Search at the Guardian event was how difficult it is to get search right, particularly when so many of the queries in a typical day belong to a long tail of relatively unique “edge cases”. In effect, there are a small number queries that are incredibly common, but a vast number of queries that are incredibly rare. Optimising for the head is an ostensibly straightforward undertaking; optimising for the tail an entirely different proposition. But this phenomenon isn’t unique to the Guardian – in fact it is true of language in general: almost all* natural languages are characterised by Zipf’s Law, which states that “given some corpus of natural language utterances, the frequency of any word is inversely proportional to its rank“. So the most common word will occur twice as often as the second ranked word, etc. And it’s not just the terms themselves – if you take higher-order structures, such as named entities, part of speech tags, partial parses, etc. you find the same phenomenon: a power law probability distribution. Intriguingly, the same relationship occurs in many other phenomena totally unrelated to language, such as the population ranks of cities in various countries, corporation sizes, income rankings, and so on. But I digress. The reason I mention this is that the same issue we saw at the Guardian a couple of weeks ago was fundamental to our work at Reuters almost a decade ago. We may have had a different set of goals back then, but the underlying principles were the same. In our case, we used the insight into those distributions to inform our approach to the creation and management of taxonomies (and associated linguistic resources). By good fortune, we documented our initial work on this in the short article below. Almost a decade on, it’s still worth reading verbatim. BTW this work was done in collaboration with my ex-Reuters colleague Mark Stevenson. *NB Ever since my PhD days I’d always believed that Zipf’s Law was a universal, i.e. something innate to the structure of all human languages. But according to wikipedia, it applies only to “most”. Can anyone cite a counter-example? Reuters produces 11,000 news stories daily, for a variety of financial and media clients. Many people rely on this information for making key business decisions. An important part of that decision-making process is ‘contextualizing’ the news – i.e. relating it to other information, such as stock quotes, investment research, company reports, and so on. So how can companies like Reuters help their clients gain access to such related information? One way is through the construction and maintenance of information directories, such as catalogues of people, places, and organisations. A database of people, for example, could provide biographical details of all the key individuals in the news. Likewise, a database of organisations could provide valuable historical and reference data. And a database of places could give geographic locations, map references, population data, and so on. But building and maintaining such directories is clearly a significant task for all but the most limited of applications. Besides, how large does such a directory need to be? How many key individuals does a company like Reuters need to include to provide 90% coverage (for example) of all the people mentioned in an average day’s news? Similarly, how many companies are needed to give 90% coverage of all the organisations mentioned? To answer these questions, Reuters Chief Technology Office (CTO) turned to InXight‘s ThingFinder, and a freely-available collection of news stories known as the “Reuters Corpus“. This collection contains 800,000+ Reuters news stories, from August 1996 to August 1997 – a full calendar year of (English language) Editorial output. CTO staff set to work on the problem by trying to measure the rate at which names (of people, places and organisations) appeared over the 12 months of the Reuters Corpus. Each month’s data was analysed in turn and the percentage of unique names that had not been seen in any previous month was calculated. Of course, during the first month, all the names were new, so the proportion of unknown names was 100%. But over the course of the year’s data, month by month, more names could be added to the list of known (i.e. previously seen) names, so the proportion of unknown (i.e. new) names became progressively lower. However, even after gathering 11 months of data, it became clear that the proportion of unknown names would take much, much longer to approach zero (if indeed it ever would). In fact, by the 12th month, as many as 29.1% of the names had not occurred in the previous 11 months (see Figure 1). Moreover, some types of name showed a higher ‘turnover’ (i.e. rate of change) than others: by the 12th month, only 7.3% (189) of locations were unknown, whereas 25.9% (6,038) of organisations were unknown, and as many as 33.4% (9,892) of people were unknown. In effect, this means that even if you gather data on all the people mentioned in the previous 11 months of data, this will still only cover around two-thirds of the people mentioned in your next month’s output. Clearly, this has significant consequences for the prospects of building a comprehensive people directory. However, there is one subtle distinction we should consider. 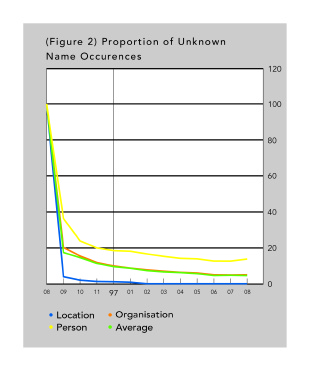 The above analysis was based on the proportion of unique names, and ignores the number of times each name is mentioned (for example, Microsoft and Bill Clinton are two unique names, but both may be mentioned many hundreds of times in an average month). So if, by contrast, we perform the same analysis based on the actual occurrences of each name (and take into account such multiple counts), a different picture emerges – and we find now that only 5.6% of the names mentioned in the 12th month are new (see Figure 2). Moreover, when we break this figure down into the distribution for each name type, we find now that only 0.2% of locations are new, 5.4% of organisations are new, and 13.0% of people are new names. Evidently, in any one month, there are a few names that are mentioned a great many times, and a great many names that are mentioned only a few times. Interestingly, this effect is not restricted to named entities – indeed, the everyday words of most human languages also display this characteristic (a phenomenon known as ‘Zipf’s Law‘). 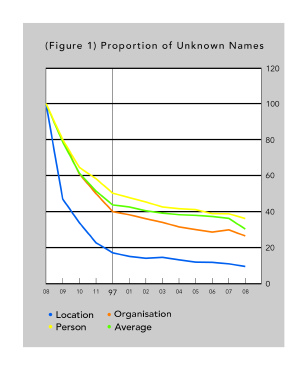 These figures provide valuable evidence regarding the magnitude of effort involved in creating a comprehensive database of names (particularly of people). Clearly, providing complete coverage is almost impossible, since new names appear so frequently (as many as 29% in a given month will be unseen in the previous 11 months). On the other hand, since many of the actual name occurrences are accounted for by a smaller number of individuals, it may be possible to build a database that covers a large proportion of people occurrences based on just 11 months of data. Of course, the issue of exactly what level of coverage to provide remains to be decided. But based on the above analysis we can now plan for such an undertaking much more effectively.